The Missing Blog: Jo Youle: "How letting down a friend taught me something important"
Jo Youle: "How letting down a friend taught me something important"
Missing People CEO recounts a sad experience to learn from. Sadly, a very close friend’s mum died recently. I was pleased to be able to sort out work and childcare so that I could be at the funeral to support her. I Googled the cemetery address, and also did a ‘belt and braces’ check with my friend via text the week before to make sure I’d found the right place. She replied that it was the only crematorium in town. On the day, I set off and arrived well over an hour early. I checked with a guy working in the graveyard that I was in the right place, and he confirmed that I was at the Basingstoke cemetery. In the distance, I saw a whole load of folk leaving after the 12 noon funeral service; all dressed in black, slow and sombre. I had that slight sense of dread that that would be us lot in an hour or so. I sat in the car and felt kind of pleased with the extra time I had. Later, though still early, I asked one headstone engraver where the services take place, and he pointed me to the small church in the middle. I thought it was nice that it wasn't in the usual 1960’s dreary civic buildings. I hung around outside the church and noticed the door was locked - there was no one around. It was a bit eerie, almost too deserted, and I waited, reading headstones, feeling thankful to be alive as you do in these places. I started to feel uneasy about 1pm, when the service was due to start in 15 minutes. No one had arrived. I couldn’t ring my friend, since she’d be in the funeral car. Then, the man I’d spoken to when I first arrived came over to me and asked “anything I can help with?” I told him what I was waiting for. 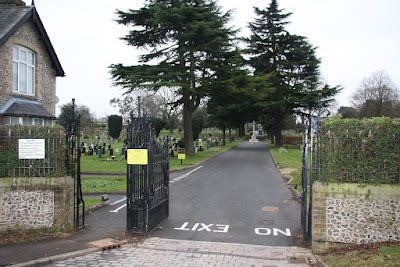 He then said “oh, you want the crematorium ‘love’, 10 miles from here, this is the cemetery”. I did a slow motion fall apart; I couldn’t get any words out whilst he tried to give me directions to where I needed to go, 10 miles away, with no chance of getting there. Game over. I cried. Gutted that I wouldn’t be there for my friend. Embarrassed with myself. I sort of knew something wasn’t right, and I hadn’t listened to my instinct. I’d simply gotten the wrong ‘idea’ in my head from a couple of weeks before, and everything I did, Googled, and checked from that moment forward merely confirmed that I was in the right place. A bad case of confirmation bias. It’s a pervasive thing, confirmation bias. And all the more annoying since I’d been ‘on the watch’ for it after receiving warning on a course I'd attended a few years ago for newbie CEO’s. There they’d told of huge companies slowly leading themselves to disaster by distorted realities, even when all the data and information suggested a different picture. Think of the now stereotypical examples: Xerox, Kodak, Blackberry. We create worlds for ourselves which confirm our own thinking and beliefs. Our own personalised echo chambers. We select newsfeeds, watch the ‘bits’ we like on 'catch up' TV, select ‘our sorts of people’ to follow, whilst Facebook selects things for us - algo-rhythmed around our web browsing. And as for Twitter, it is so bespoke that I’m sure most people could be psychologically profiled purely on the people they choose to follow. And then we prune and edit further. I’ve done it myself - unfollowed people who insist on posting articles from newspapers I wouldn’t even wrap my chips in. Setting off with the wrong hypotheses can have the most serious consequences. Listeners of Serial and Undisclosed podcasts, and watchers of Making A Murderer will have learned about injustice when the (wrong hypotheses) rules evidence 'in' when it supports the theory, and 'out' when it doesn’t. It can be devastatingly life changing. I was thankful to join my friend at the wake after the funeral I missed. And beyond my embarrassment at becoming a ‘story’ on a day when I just wanted to be there, it wasn’t held against me and I was greeted only with hugs and a rather large glass of wine. I’m not sure why I got it so wrong. Emotion. Over confidence. Being on my own. A tad smug as someone who travels all over (the UK!) – pride and fall and all that. I’ll never mix up 'cemetery' and 'crematorium' again; that much I know. I’ll go back to trusting instinct a little more, and Sat Nav a little less. And I’ll always be sorry I wasn’t there for my friend.